This recipe is for the apple "vlaai" that Frieda, my mother, used to make. "Vlaai" pies are traditionally made in the (far) southeast of The Netherlands, even though the name is probably derived from an old German word for a flat tart (food, not the other kind of tart). The crust of a "vlaai" is neither a pastry crust, nor a pie crust. A "vlaai" has a filling of apples, cherries, plums, apricots, or gooseberries. No whipped cream on top, or layer of baker's pudding inside. Dutch and English apple pies date back at least 500 years. Apple seeds were introduced to (colonial) North America in the 17th century, as were apple pie recipes. Which apple variety to use? The apples should have lots of flavor, not be too sweet, and not fall apart when baked. Examples: Cox Orange (classic! ), Elstar (light sour note, flavorful), Jonagold (sweet-sour), Boskoop, Gravensteiner, Granny Smith. Also: Idared (sweet), and even Braebrun (firm). Use amaretti with a high almond content; they should be dense and chewy. They typically have a diameter of 3-4 cm (1.5 inch). See photo below. Do not use the small, hard, hollow, "bone-dry foam" Saronno-style cookies! Alternatively: use 120 grams (4 oz.) almond paste (at least 50% almond content), crumbled. 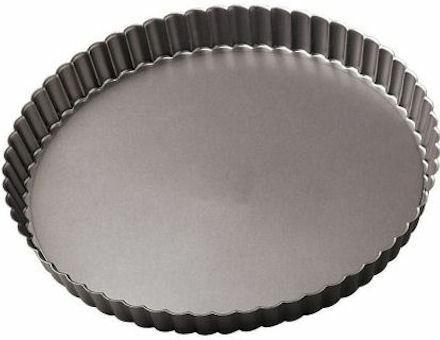 Traditionally, a thin pie pan ("flan tin") is used that has a fluted side wall (like a quiche pan), that leans outward (i.e., is sloped, not vertical). See photo below. The bottom should be flat. Non-stick is great, as is a removable bottom. Optional: kitchen machine with a dough-hook. Powdered sugar (F: sucre glace), for dusting the baked "vlaai"
Quarter and peel the apples, remove the core. Note: the sugar will draw liquid from the apples. The dough should not be sticky; if sticky, add flour, 1 tablespoon at a time and knead until well absorbed. Form the 2/3 dough part into a ball; dust your work surface slightly with flour, and roll out the ball until big enough to cover the entire pie pan, and only slightly overhang the edge of the pan. Transfer the apple slices to the pie pan and distribute evenly. Do not to transfer the liquid that has drained from the apples! Bake in oven for 35-45 minutes, until dark golden. After the vlaai has cooled off, dust with powdered sugar.